The first exchange-traded fund (ETF) to be managed by artificial intelligence, AI Powered Equity ETF (AIEQ) was launched with a bit of fanfare back in October 2017. After all, it used the ground-breaking (and Jeopardy-beating) logic of IBM’s Watson Artificial Intelligence to manage the stock selection and portfolio management function. Asset growth started slow, then jumped to over $100 million in 2018 and it currently resides close to the $150 million range. The benefit to the investor of this ETF is its active strategy that is insulated from behavioral biases and scours all financial and unstructured (news articles) information as the portfolio management approach. Its investment goal is to outperform the broad equity market (investing in all market capitalization sectors) at a similar level of risk. In theory, it should provide a good low-correlated complement to an index-based approach to portfolio management. Performance since inception has been mixed. It has rotated from lagging, then matching, then beating (by a lot! ), then lagging again (by a lot! ), while now recently beating the S&P 500. 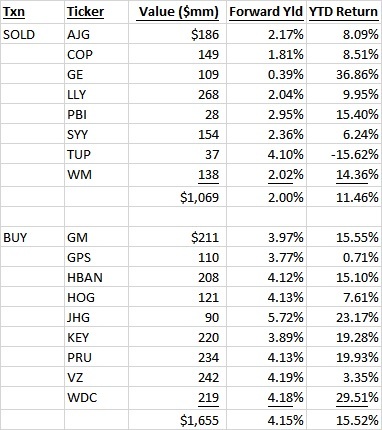 From inception through April 5, 2019, AIEQ is up +15.4% compared to SPY being up +16.4%. On a YTD basis through April 5, 2019, AIEQ is way ahead at +21.46% compared to S&P 500 at +16.02%; ranked in the highest 2 percentile in its Morningstar Large Blend Category. It is too early to evaluate how well AIEQ has performed as a portfolio complement, but it has certainly provided a strong case for it to remain as a portfolio position. Unlike tactical asset managers, the drawdown in 2018 Q4 did not scare away AIEQ from its portfolio positioning. Some constant large exposures in Alphabet (GOOGL), Amazon (AMZN), Costco (COST), NETAPP Inc. (NTAP), and SS&C Technologies (SSNC)(overall, 10.7% of its portfolio) have contributed to its 2019 recovery (and last years drawdown!) AIEQ maintains a current cash weighting of 3.7%. What can we learn from how AIEQ weathered the 2018 Q4 drawdown leading into 2019 Q1? First, if you have a strong fundamental basis, there is no reason to run away from your core positioning since they will recover. Certainly, one of its largest holding in Amazon and its -25% drawdown in Q4 could have scared away many active investors; and perhaps causing it to miss its strong 22.3% YTD recovery. Second, there will be periods where you will underperform the market, but over a long horizon you only need to be right 51% of the time to provide an advantage. Third, relatively large and diverse positions can create alpha if you have a firm conviction; for example, AIEQ is currently overweighted to Alphabet (GOOGL) at 3.8% compared to its S&P 500 weighting of 3.0%, thus benefiting from Alphabet's +15.9% YTD index-matching performance. Additionally, broadening the universe to include all market cap sectors provides better diversification exposures. AIEQ includes three mid-cap holdings in its current top 5, being SSNC, NTAP, and Aaron's (AAN). I have written a lot about iShares Select Dividend ETF (DVY) over the years and been a long term advocate and holder. I am a fan of the underlying index methodology and still believe it is the best combination of fundamental factors to support long-term growth of principal with a high level of income. However, despite DVY being an ETF with its high level of transparency, it is hard to nail down the sources of return without some sleuthing. Such is the case with today’s huge $0.12 per share increase in the quarterly dividend; from $0.75/share in December to $0.87/share declared today. On the surface, some of the increase must have come from normal dividend increases on its holdings, but a more interesting source seemed to come from the changes in the portfolio from December to now. I checked the change in the portfolio from December to now and see a swing in over a $1 billion in low yield holdings into higher yield holdings. Per the table below, DVY sold $1.1 billion of holdings at a 2.00% forward yield (with YTD total return of 11.46%) and bought $1.7 billion of holdings at a 4.15% forward yield (with YTD return of 15.52%). I cant tell exactly when these transactions occurred, but more than doubling the yield on about 6% of the portfolio during the quarter has a lot to do with the dividend increase. Other things like the unusual low dividend payment in December, timing of dividend payments, and other portfolio rebalancings are also factors. An often overlooked area in the investment universe are closed-end funds (“CEF”). These investment vehicles look and feel like mutual funds and ETFs, but they are “closed.” That is, once they are set up, no new shares are issued (usually) and investors must buy and sell shares on an exchange. Unlike ETFs that are structured to trade on an exchange with “authorized participants” bidding shares close to the net asset value (“NAV”), CEFs have no like structure. In fact, it is unusual for a CEF to trade close to its NAV, with the most often situation being CEFs trading at a discount to NAV. Many advisory firms manage CEFs that target the bond universe. However, due to the active (some of which are hyper-active) nature, calling these vehicles “bond funds” is a misnomer. Many of these vehicles have risk/return profiles that are equivalent to equity-type investment. One such CEF is the PIMCO Corporate & Income Opportunity Fund (PTY). Looking at this “bond” fund is an exercise in awe! Its 15-year annual total return ended March 17, 2019 is 13.43%; that blows away the Bloomberg Barclays Aggregate Bond Index of 3.63% and trumps the S&P 500 of 8.57%; but at a bit higher standard deviation risk of 15.32% compared to the S&P 500 risk of 13.58%. The reason for this is clear. Though PTY is a “bond” fund, it is a “black box” hyper-active bond trading strategy – you are really paying the investment manager (PIMCO) to make all kinds of bets hoping it pays off; any bond-like performance you may see (such as coupon payments) is incidental. The fund is active in derivatives (interest rate swaps) and uses a lot of leverage. This ultra high risk/return profile has not gone unnoticed in some circles. PTY has historically traded at a relatively high premium to NAV (often in the 20% range) as return seeking investors bid up shares hoping to cash in on its strong historical performance that has continued to defy gravity for 9 of the last 10 years with high top quartile performance. Volatile markets caused the premium to crater in Q4 2018, but it has pushed back up to the 20% range during Q1 2019. In addition to PTY’s high historical total return performance, the fund has a strong record of paying a flat $0.13 per share distribution every month. This $0.13/share payment equates to a yield of 9.06% at a price of $17.21 (as March 14, 2019). In the case where PTY does not generate enough income to cover the $0.13 distribution, it continues to pay $0.13/share by including a true-up “return of capital” to keep the payment level constant. This is useful to an investor who is using the distributions to cover living expense in retirement and counting of consistency. Some investors who can afford the relatively high risk profile could benefit from the high level of income and high total return profile. Most of the income is taxed as ordinary income, but the high yield rate makes it still attractive on an after-tax basis. It’s that time of year again when all the mutual fund companies trot out their annual reports with smiling faces to promote their wares. 2018 was a tough year for most fund companies; especially those with active mandates. According to S&P Versus Active (”SPIVA”) reporting at December 31, 2018 for active large cap mandates, over 5-, 3-, and 1-year horizons 82%, 79% and 64% of active managers underperformed the S&P 500, respectively. It is interesting to see how this fact is communicated to shareholders. One fund company that I follow seems to report everything with a smiling face when the underlying facts and figures are to the contrary. For example, this is from the Executive Chairman’s letter to shareholders, “…believes active risk management offers downside mitigation and may improve investment outcomes” and “long term perspective” is “ensuring our investment decisions align with the investing time horizons of our clients.” This statement seems to indicate that short term blips in performance are less important than the longer term perspective; so don’t worry about 2018! When I check the numbers against the text, it doesn’t match up. As we all know, the S&P 500 was down -4.38% in 2018; the fund I am looking at was down -5.31% so it underperformed. We would expect the Executive Chairman to say something to mitigate this -0.93% underperformance in 2018. However, when I look at longer term returns I don’t see much difference. Over 5- or 10-year horizons shown in the annual report we see continued underperformance to the S&P 500 of -1.28% and -1.10%, respectively. These figures are just for “A” class shares (60% of the fund), underperformance is worse for the higher cost shares and better for the lower cost institutional shares. So, it is hard to see how the Executive Chairman can say something like he did, when the numbers don’t match the words. The “long term perspective” did not help shareholders! Of note, the $5.1 billion mutual fund saw net outflows in 2018 of -$550 million (about 10% of the fund) so someone is noticing. All I can say is “Buyer Beware”! Though most advisers accept that a goal-oriented cash flow approach is the best way to determine your readiness for retirement, some people still look for their “number” – a metric made popular by ING commercials back in 2010. You know, the dollar amount that is saved somewhere that guarantees sunny days and margaritas on the beach during retirement. Most of the time, this hypothetical “number” is never adjusted for the dreaded “deferred tax liability.” Let’s see how this works and can impact your retirement readiness. Let’s say you have $1,000,000 saved in two equal buckets; one tax-deferred and one taxable, each with $500,000. Let’s also assume you grew each account by saving $5,000 per year for 25 years and earned a bit over 10% on your investment portfolios. 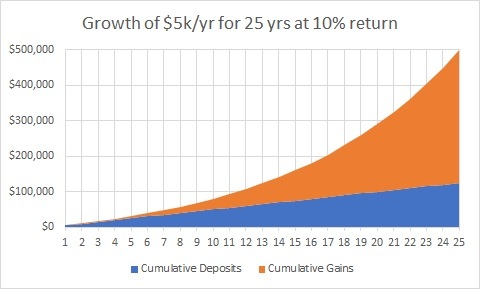 The benefits of compound interest are immense (see chart), since each account would have unrealized gains equal to about $375,000 on cumulative deposits of $125,000 to total $500,000. For the taxable account, if we assume a 15% Federal long-term capital gains rate and a 5% state tax rate, the deferred tax liability is simply $375,000 * (0.15+0.05) = $75,000. The trouble gets bigger for the tax-deferred account, since the whole account is taxed at your ordinary income rate. Assuming a 22% tax bracket and a 5% state tax rate the deferred tax liability is $500,000 * (0.22+0.05) = $135,000! So, you may have $1,000,000, but your total $210,000 deferred tax liability takes a big bite out of the glowing aura! Goal-oriented cash flow investment modeling software does a good job adjusting for this and is a much better way to evaluate your retirement readiness. How Much Do You Get Paid For Your Risk? We all know that more risk usually provides more return, but do we all know by how much? There are many different ways to answer this question with multiple factors to consider. A simple way to look at this is to examine the most recent annualized returns and risk (measured as standard deviation) for a consistently managed diversified portfolio index. One such index is the Dow Jones Relative Risk Portfolio index; specifically, the series that includes global asset classes. The Dow Jones global indices are structured to provide a smooth exposure to risk with a diversified equity, bond and cash allocation. The Conservative index is structured to provide 20% of the risk of a 100% equity portfolio, the Moderately Conservative index is designed to provide 40%, and so on. As can be seen from the table, one picked up about 2% in annualized return over the past 10 years ended December 31, 2018 from purely picking one risk tolerance compared to its adjacent neighbor. So, please take your risk tolerance seriously and make sure it fits with your realistic capacity to bear risk. Factors to consider include your overall wealth, income, and lifestyle; as well as your desire to sleep well at night! How Good is your Asset Location? Most pre-retirees and retirees have a combination of taxable, tax-deferred, and tax-free accounts. Different asset classes have different characteristics that make them better candidates for each of these types of accounts. In general, an asset class that generates a high amount of taxable income, like high yield bonds, bank loans, and emerging market debt, are relatively LESS tax efficient in a taxable account compared to a tax-deferred or tax-free account. Alternatively, an asset class that generates a small amount of taxable income, like U.S. growth stocks, emerging market equities, and commodities, are relatively MORE tax efficient in a taxable account. This is because, of course, assets that don’t generate much taxable income and instead generate most of their return from unrealized gains over time don’t pay taxes until desired and at a preferred lower long-term capital gains tax rate if held more than one year. I am sometimes surprised when I see a tax-deferred account with a large allocation to some clear long term equity winners like Apple or Amazon. Sure, stocks like these have generated outsized gains over time, but the gains will be taxed at usually higher ordinary income rates when withdrawals are made from the tax-deferred accounts instead of at lower long term capital gains rates. Maybe it is counter-intuitive to some, but stocks like these are better off held in a TAXABLE account to make use of the lower long term capital gains rate, or even the cost basis markup upon bequeath after death! Vanguard and others have done work defining the benefits of investing with a focus on tax-optimized asset location (“Vanguard Advisor’s Alpha”). It depends on a number of variables, but Vanguard has published that it can be worth from 0 - 75 basis points. It is worth understanding the pros and cons of tax asset location, and then customizing a mix that suits the needs of the investor. Dividend-paying stocks have been a great place to be for the past 10 years or so. After the Great Recession in 2008-09, investors looking for yield were forced to look elsewhere from treasury bonds. Treasury bond yields were around the mid-3’s in 2009-10, but quickly fell to the 2% range in 2011 once the Fed’s aggressive quantitative easing (QE) steps took hold as a more proactive force to prop up the weak economy. The benefit of dividend-paying stocks at that time was clear: earn more than treasury bonds AND have the potential for price appreciation, something that bonds were unlikely to provide given the historic low level in yields. This hand played out very well over the past 10 years as dividend paying stocks, represented by the iShares Select Dividend (DVY) ETF, continuously out-yielded 10-year treasuries AND provided some great price appreciation (see the attached chart for detail). Yes, much more risk trading bonds for equities, but if the need for yield is what drove the investment decision and there was less of a focus or need for price stability, then the investor was aptly compensated. The question now is, “will this continue?” Can the past 10-years of a “once-in-a-lifetime” scenario continue? Certainly, DVY still has a yield advantage over 10-year treasuries and we are observing a “dovish” Fed currently, so in the near term, “sure”. In fact, tough to see this situation unwind, since if the yield relationship reverses, then there could be a flurry of demand for Treasuries, thus pushing their yields down. We shall see. Smaller Tax Refund? Big Deal! The mainstream media is abuzz about the smaller tax refunds being sent out by the IRS this tax season. The New York Times says, “Smaller tax refunds surprise those expecting more relief”, CBS News says, “Americans shocked by impact of new tax law”, while Fox News says, “Smaller tax refunds are a good thing”. Each media outlet has their own spin depending on their agenda, but the real issue is the lack of financial literacy and planning to avoid surprises that could have easily been avoided. The new tax laws effective for 2018 were well communicated if anyone took the time and energy to understand them; certainly the tax and planning industry was well-versed in the impacts. The elimination of tax deductions due to the $10k limit on state and local taxes (SALT) and the limit on the interest deduction on high value mortgages became a new tax burden for residents in high tax and high property value states. The almost doubling of the standard deduction was intended to lessen that burden, but some high income earners with large SALT and mortgage interest were sure to see an increase. So, taking the lowered payroll withholdings due to the lowered tax brackets was a flawed assumption if you ignored the loss of those large deductions in your tax planning. Alternatively, if you were NOT a high income earner, your total Fed taxes likely went DOWN, but you simply got a smaller tax refund because you took a portion of your end-of-year refund in smaller bits during the year due to the lower withholding amounts. Effective planning could have easily avoided this “surprise”. Moreover, consistent with the Fox News article, a Treasury spokesperson said in a statement, “Smaller refunds mean that people are withholding appropriately based on their tax liability, which is positive news for taxpayers.” Unfortunately, this seems to have happened to some taxpayers due to inaction and ignorance instead of through conscious planning. Keeping more of your money during the year with an effective saving and investing strategy makes much more sense than giving the government an interest-free loan during the year. Hopefully, this kind of event will cause a more focused interest in financial education and planning. "V" gets a Vote of Confidence! “Buy the Dip” appears to be alive and well! After the abysmal October leading into the horrid December, things have recovered quite nicely! From the recent plateau on December 3, 2018, the S&P 500 (per the ETF, SPY) is only 0.77% off that level per the above chart. Not a pure “V”, but pretty close! Though the mainstream media does a good job pitching its dire Koolaid to drive ratings and eyeballs, the doomsayers have not been too accurate thus far. On these pages, I have commented on weaknesses in the predictive ability of a yield curve inversion to forecast a recession, identified underlying strength through the important PMI (Purchasing Mangers Index) levels, talked about positive technical factors such as seasonal rebalancing into equities after the large Q4 and December drawdowns to get back to equity targets, and highlighted some well-thought out (and positively-leaning) forecasts from Northern Trust Asset Management and my prior firm, Sun Life Financial. It is a very rare situation, indeed, where it would be prudent to rebalance away from a strategic allocation to “risk” assets. The situation through December indicated a reasonable case to be cautious, but not fearful, while waiting for some key economic statistics to show their hand. Happily, hanging onto your hat and weathering the storm appears to have paid off this time - for now. Last month I reported that Cambria Investment Management, a popular tactical investment strategist, put out an update titled “Red Light” indicating their cautious market stance. They put their money where their mouth was and positioned their tactical ETF, ticker: GMOM, into mostly bonds and precious metals. So, how have they done so far this year? Based on results from Morningstar year-to-date through yesterday, Feb 7, they are up +1.89% compared to the S&P 500 of +8.09% and the Morningstar Moderate Target Risk of +5.48% and the World Allocation of +5.40%. Since this is an ETF, we can track their actual holdings every day. As of yesterday, they have kept a 7% allocation to precious metals, but shifted to a 30% equity weighting mostly in emerging markets, global utilities/healthcare and real estate. So, still cautious, but holding some risk assets in a barbell manner with both risky and traditionally defensive sectors. The past three years have been very good for the Vanguard Stable Value option in 401-k plans compared to core bonds represented by the Bloomberg Barclays U.S. Aggregate Bond Index. Check out the chart from Vanguard’s website - A much less bumpy ride over the past three years to end in about the same place! It is hard to overlook a dramatic increase in one of our most important economic statistics, the ISM Purchasing Managers Index (PMI). Observers were warning to be cautious when the December value came in at a weaker growth level of 54.3, down from the 58.5 level of November. Values over 50 indicate growth and under 50 indicate contraction. So, it was surprising when January came in at a level of 56.6, improving to close in on the November level! The current level of 56.6 is still below its 12-month average of 58.5, but the upward trend is a positive result. Most interestingly, this growth in the PMI can be correlated to a 4% real GDP growth, so underlying strength in the economy seems robust if it can be maintained. Some observers are calling this the “Goldilocks” economy, harkening back to a time when stable interest rates, low inflation, strong job growth, strong dollar, and strong earning growth all coexist without any observed stresses. We shall see. The mainstream press is agog over the capital market performance in January 2019. “The best January since 1987”, “Best Month in three years”, and “Best Monthly Performance in Decades” are plastered all over as headlines. Yes, the markets had a great month with all major indexes making big moves upward, but lets take the performance within the proper context. As we all know, December was very weak! Though there were many factors flashing a warning sign, but nothing in the tactical tool box indicated despair and anything resembling a prolonged massive selloff. I believe it was fair to be cautious, but no reason to be risk off. So, it is quite logical to recover from an “oversold” position with a strong move in the opposite direction. Also, I have been a fan of supply and demand aspects occurring in January where most institutions and client accounts get rebalanced to their long term strategic targets; and given the October and December equity drawdowns, it certainly made sense that equities would see a “buy” sign to get back on side. The Dow Jones Aggressive U.S. Portfolio Index, a 100% equity index including large, medium, and small cap stocks was up +10.20% in January recovering from a -9.97% December; not quite a full recovery, but close. We will see if the market has enough confidence in the new dovish Fed stance and potential for easing of China trade tensions to recover from the October drawdown to approach new highs. Bond Ladder? Yes or No? When? There has been a lot written about bond ladders over the recent past. Unfortunately, lots of what has been written is misinformation. The idea of a bond ladder is to buy bonds with different maturity dates in sequence; i.e., 1-year, 2-year, 3-year, etc. so that they mature at scheduled dates at their full par value. You get all the interest and the full principal back at par value. The thought is that in this way you will never lose money in bonds if rate rise (since that is when bonds decline in value). The problem arises when you compare a bond ladder to a traditional bond fund or ETF. The comparison usually starts with the naïve view that the bond ladder didn't lose money and outperformed the bond fund/ETF over a certain rising rate environment. However, that comparison only makes sense if the maturing pieces of the bond ladder were taken out of the ladder and spent on something like an expense. In essence, you were shortening the duration of your bond investment and of course that would outperform a bond fund with a longer duration. If the bond ladder were instead reinvested in a manner similar to an equivalent bond fund at inception maintaining its target duration, the results would be exactly the same. The only times that a bond ladder makes sense is when the interest cash flows and maturing pieces are to be used to fund some liability or expense, immunizing the liability or expense cash flows. In that case a bond fund/ETF would be inferior since you would be taking on interest rate risk when you instead needed to shorten the duration of your assets to match the duration of your liabilities/expenses. Morningstar Advisor magazine, a publication from Morningstar tailored to the advisor population, consistently produces high quality commentary and analysis on investment topics. One of my favorite articles was published way back in 2013 relating to market timing; I.e., the ability to be in the right asset class at the right time to pick off every inflection point in market volatility. In the article titled, “The Existence of Market-Timing ‘Intelligence’”, they quoted a study showing what could be gained if an investor had perfect foresight. In other words, what is the best someone could do if they called every market rally and dip. The article states that from 1926 to 2011, if an investor correctly chose the right bond or stock mix each month the total return would have been 31.9% annualized; a value much higher than the long term stock-only portfolio of about 10%. The difficulty remains, however, to be able to find the manager “ahead of time” who has the ability (or luck) to be successful in this endeavor. I make it a point to follow all competing views in the tactical manager space to gather a balance insight and view on the capital markets. I don't take scientific polls, but I certainly have seen a shift to “defensive” positioning in that space. One popular tactical manager, Cambria Investment Management, sent a note around yesterday titled, “Red Light?” They make the point that they don't know if the market is going up or down, but their signals are indicating a defensive posture. They have put their money where their mouth is, too. The current positioning of their tactical ETF (GMOM) is invested almost entirely in bond funds and precious metals, as opposed to equities (http://www.cambriafunds.com/gmom-holdings). YTD their total return of +0.58% compared to the Morningstar Moderate Target Risk of +2.29% and the S&P 500 of +3.10%. Yesterday, when the S&P 500 was down -0.51%, the GMOM ETF was up +0.02%. Curious to see how this works out? I will check back and post an update in a month! Follow me to see.